San Sebastián is famous for its fantastic beaches. These beaches stretch along beautiful bays surrounded by green mountains and the blue sea. 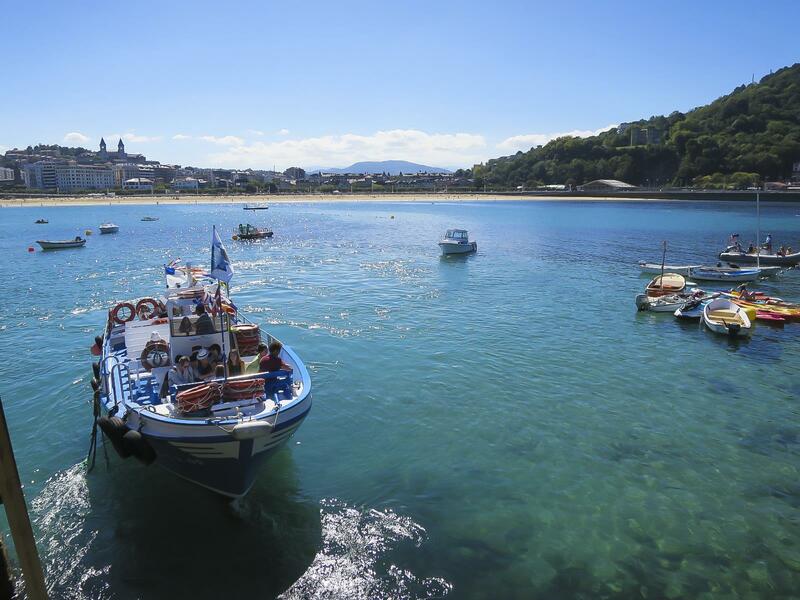 From the beach you'll see small boats making wonderful trips to the island in front of the city. Fortunately, you can also explore the island and enjoy an adventure out on the water. The island of Santa Clara is located in the middle of Concha Bay, San Sebastián. It is a picture that adorns many postcards and is an intrigue to any visitor - and rightly so! 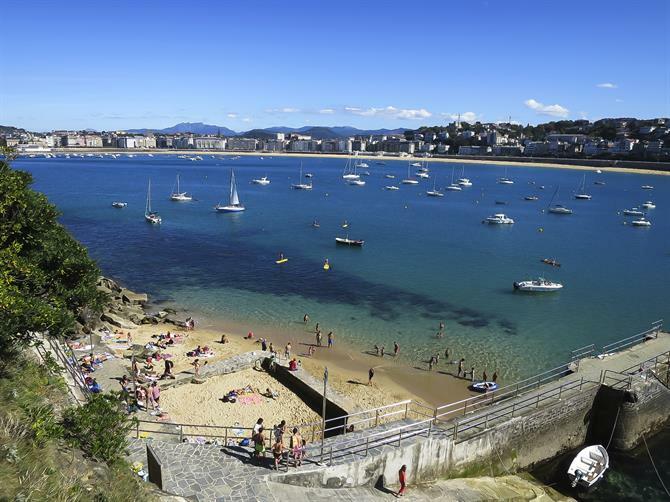 The small green island is often voted 'the most beautiful city beach bay of Europe', a must-see when you're spending your holiday in San Sebastian. Santa Clara is adorned with a white lighthouse cottage. At the foot of the island, on a hill that looks out to the sea, there is also a chiringuito bar with a terrace at the pier. These are the main structures on the island. Santa Clara has never really been inhabited, although in the late 16th century it acted as a 'quarantine zone' for people suffering from the plague. Everyone in the town that was infected by the plague were transferred by boat to the island. Today, no trace of this unpleasant history remains. 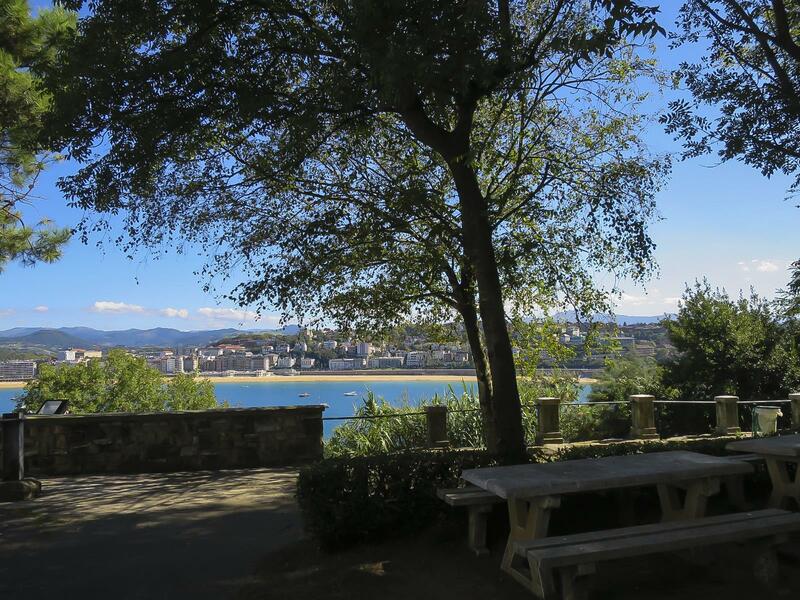 By following the sloping path up from the pier you will reach the terrace at the top. You can also enjoy fantastic views all around the island! If it's your first time visiting San Sebastián, the summer is an excellent time to discover the area. Something unique is that you can swim to the island from the beach. The distance to the island's bar from the middle of the nearest beach Ondarreta is about 406 metres, so you aren't too far off. 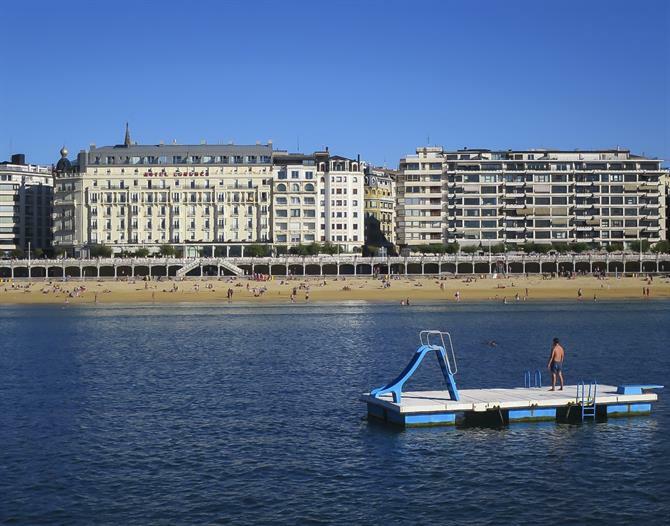 From the start of the Concha beach promenade to the far end of the pier on the island is about 1,130 metres. Halfway, there are floating 'rest stops' with slides, perfect for plunges back into the water. Or you can lie here and have a rest in the sun! From this point you can see the boats touring the bay. You can visit the island using the small blue boat. The larger white boat gives guided tours along the entire coast of San Sebastián city, which consists of three beaches: Ondarreta, the Concha and Zurriola. 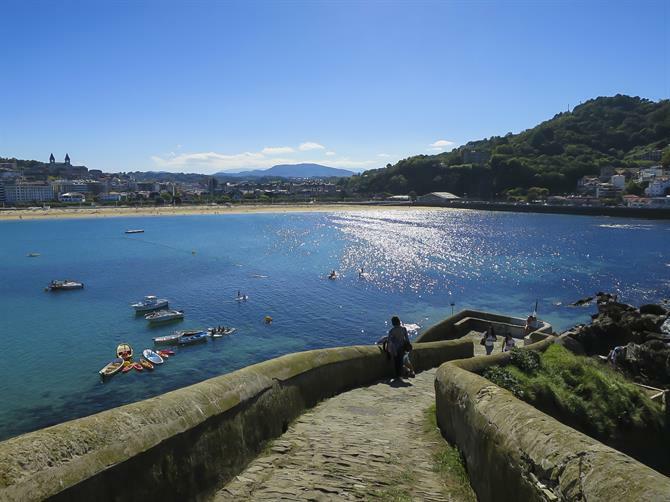 There is also a third opportunity to visit the island by kayak from Ondarreta beach. Below, we discuss visiting the Concha Bay and the island by boat. 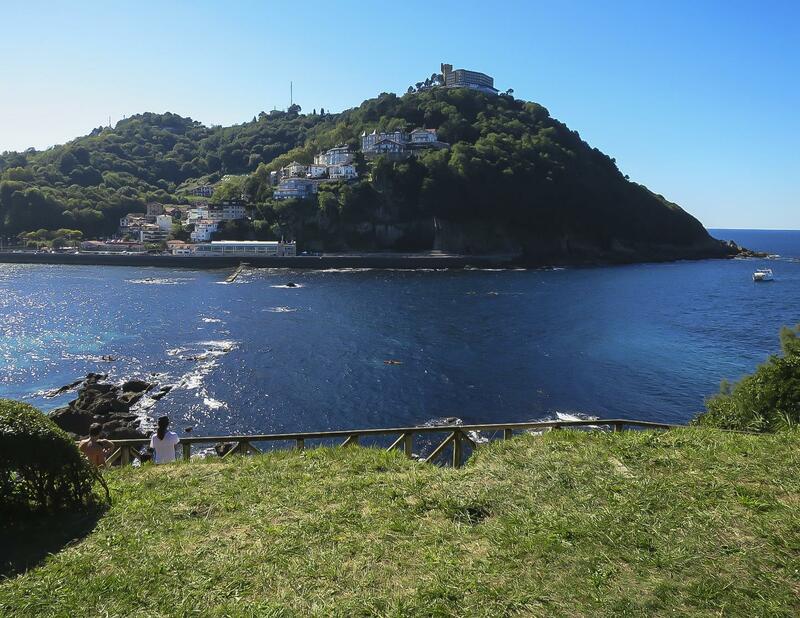 Depending on your preference, you can discover the whole of the San Sebastián coast during a kind of 'cruise' aboard the white boat or in a more sporty way using a kayak. With beautiful weather, the island tour offers a great day out. From 10:00 you can board the boat with your beach bag and picnic, then spend the day at the beach until 20:00, as well as enjoy other activities such as hiking or having a drink on the pier's terrace. A great place and Sunday favourite among locals! 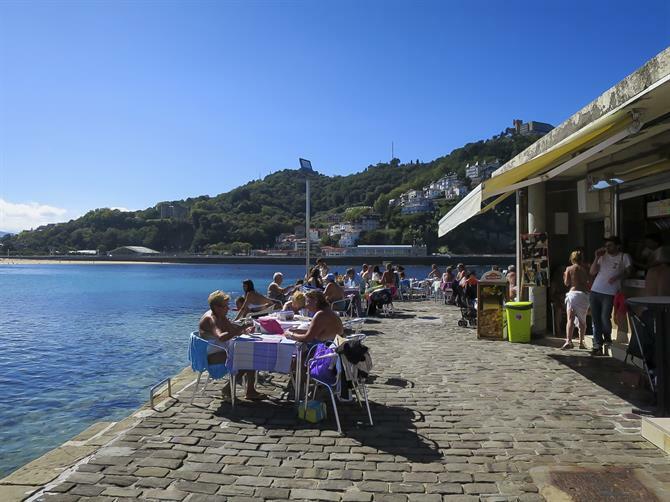 In the summertime the island is very lively, especially on the beach and at the pier's terrace. No wonder the beautiful island is sometimes called 'San Sebastián's fourth beach'. 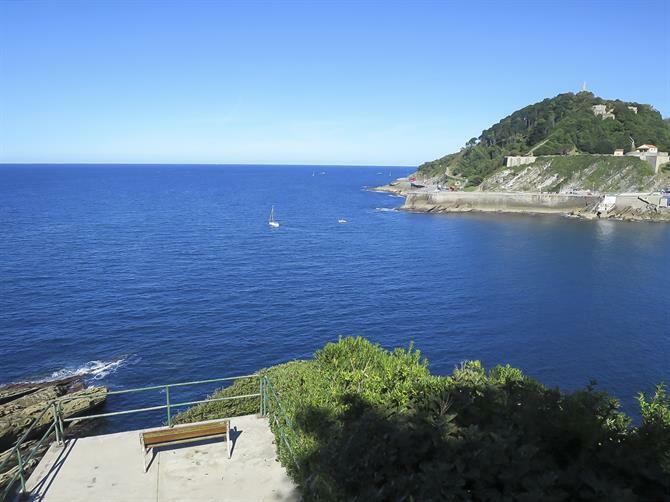 There is nothing like this small cala with its majestic panoramic view of the Concha Bay. Something special about this beach is that it is almost completely submerged during high tide. 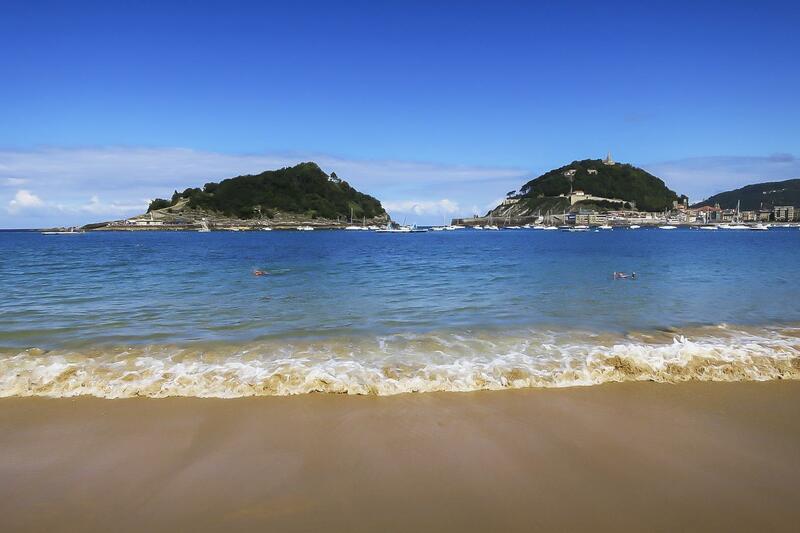 This is simply the work of the Atlantic Ocean constantly changing San Sebastián's beach coves. If you want to enjoy the beach and sand, low tide is the best time to start your day. The atmosphere on the island is cozy and family-like, with parents who take their children out on a day boat trip to see all that the area has to offer. In the summer, lifeguards and showers are also available. On the terrace you can satisfy your hunger with pizza or paella for about €10 or other simple meals and snacks. If you decide to swim to the island or go there by kayak, don't forget to bring some change so you can enjoy an ice cream or drink on your arrival. Along the island's path you can take in the view from higher up. Here there are picnic tables in the shade of the trees, as well as cottages with changing rooms, toilets and showers. During the walk along the water and up the steps to the sidewalk near the lighthouse there is a breathtaking view of the city. You can wander the island along the sea and come across spots such as this one where you can relax on a bench and enjoy the beautiful views all around. On the other side of the island there is an area where you can sit on the grass and overlook the sea, the Peine del Viento sculpture and Igueldo mountain. A romantic spot! Where you take the boat? 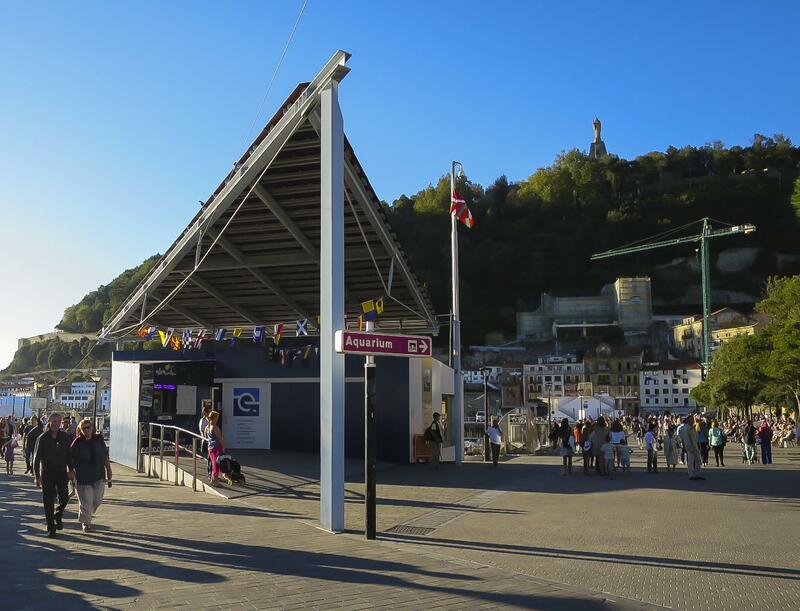 The tour starts at the port, which is also where the ticket counter is (Lasta Plaza). If possible, go during the week to avoid the weekend crowds. Boat trips to the island are organized by a private company called 'Motoras de la Isla'. These blue boats are only available in summer from 1st June to 30th September. During Semana Santa, the Spanish Easter holy week, a shuttle service is also available. There are two types of tickets available: direct transport to the island or transportation to the island with a 30-minute tour of the bay beforehand. - The price of the direct transport ticket is €4.00 round trip. These trips are available all day every half hour from 10:00 until 20:00. When the weather is less nice and there are less people, then there is only one trip per hour. 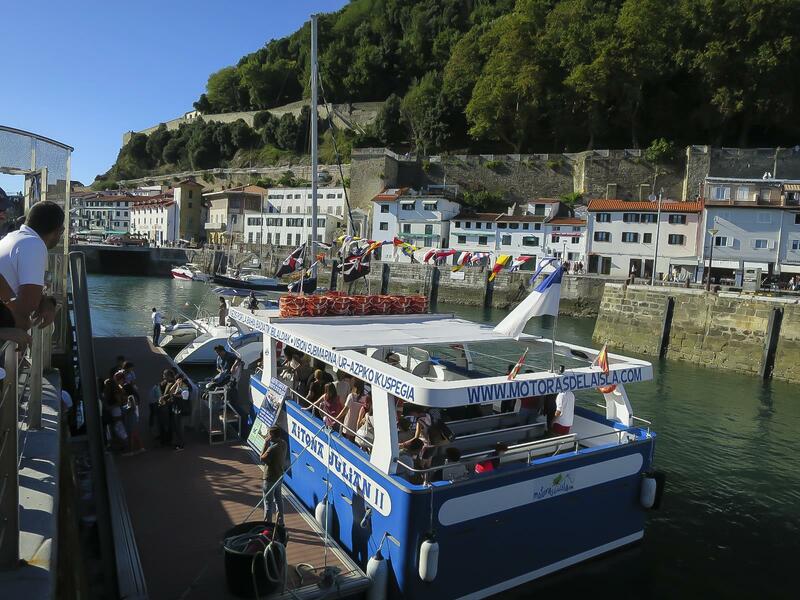 - The price of transport to tour the bay is €6.00 each way. These trips are available at the following times: 13:00 / 14:00 / 15:30 / 16:30 / 17:30 / 18:30 / 19:30. The tour of the bay is first, then you go on your way to the island. Depending on the weather and other conditions, trips may be less frequent. Therefore, it is wise to check in advance at the ticket counter. It is also possible to find out more information about the best times to go on the tour. For example, it is only at high tide that the boat nears the Peine del Viento sculpture (the famous 'Wind Comb' by the artist Eduardo Chillida). Apart from the island and the Peine del Viento, you can also look through the glass bottom of the boat to catch a glimpse of the rocky seabed. Children under four years old may join for free. There are also special prices for groups that you can check out by contacting Motores de la Isla (info@motorasdelaisla.com or tel. +34 943-000-450). Intrigued? Watch a video of a boat trip with views on the island of Santa Clara! The majestic beach in the bay of La Concha is one of the most beautiful city beaches around the world. Queens used to come here. Tips and information! In San Sebastián you can find a surf beach, a little island, and even the prettiest bay of Europe. When the sun is shining, it feels like paradise! Pets are part of our families so it's logical that we would want to include them in our family holiday. Off to the Costa Blanca this summer but not sure what to do? Here are 18 activities which are suitable for the whole family! Escape the summer heat on a trip to roaring waterfalls, dipping in cool pools and enjoying a hike in nature at the Algar waterfalls.